Explore the most spectacular time of the year in Antigua with the largest Holy Week celebration for in the world! Expert Elizabeth Bell, author of “Lent and Holy Week /Cuaresma y Semana Santa La Antigua Guatemala”, offers special tours beginning Palm Sunday through Saturday. 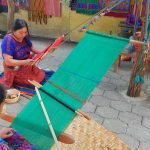 Highlights include tips on enjoying this very special holiday, carpet making, processions and a special Wednesday tour to San Mateo Milpas Altas. Each day offers different tours! 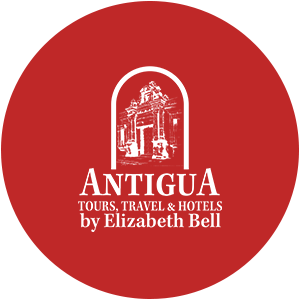 Meet Elizabeth Bell at the Antigua Tours Park office inside Café Condesa for a guided walk as Holy Week begins with grandeur. 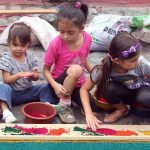 We see carpets made at their best and watch the Palm Sunday La Merced procession, providing helpful tips for getting around the busy streets of Antigua. Meet Elizabeth Bell at the fountain/Central Park for a cultural tour including Antigua’s history and contemporary life with the city’s art, architecture, history, descriptions of holy vigils and carpet making. We highlight the Palace of City Hall, Palace of the Captains General, Cathedral with its ruins, Jade Museum and Paseo de los Museos at Casa Santo Domingo. 7:00AM: Shared shuttle from your hotel in Antigua to Hotel Santo Tomas in Chichicastenango, near the market (2 1/2 hrs). 2:00PM: Shared shuttle from Hotel Santo Tomas in Chichicastenango to your hotel in Antigua (2 1/2 hrs). Located about 5 miles from Antigua, this “pueblo” procession is a contrast to the larger Antigua processions for Semana Santa and will give you a sense of how this holiday evolved over the centuries. 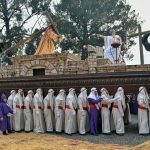 Meet at Hotel Sor Juana (4a Calle Oriente #45) in Antigua for a shuttle to San Mateo Milpas Altas to participate in carpet making for the 4pm procession of Jesus of Nazareth and the Virgin Mary carried on the shoulders of the carriers. Feel the humble nature of this authentic procession as you intermingle with the faithful locals. Drive back to Antigua. Holy Wednesday, April 17th 1:30pm – 5:00pm San Mateo Milpas Altas Processional Tour. Price: $45.00 per person includes shuttle, local host and guide for the activities. Tickets required in advance. Meet Elizabeth Bell at the fountain/Central Park for a cultural tour including Antigua’s history and contemporary life, the city’s art, architecture and carpet making. We focus on the main sites and beautiful carpet making in progress for today’s procession from San Francisco Church. Meet Elizabeth Bell at the fountain/Central Park for a tour of the most spectacular carpet making along the processional route. We see the La Merced procession and complete the tour near La Merced Church. Meet Elizabeth Bell at the fountain/Central Park for a cultural tour of Antigua’s main sites focusing on the city’s art, architecture, history and cultural trends with information about today’s women’s processions. We highlight the Palace of City Hall and Palace of the Captains General, Cathedral, Jade Museum and Paseo de los Museos at Casa Santo Domingo.